An intriguing dive watch with a Swiss automatic movement and bold design from a company you likely never heard of. To say there’s a sea of microbrands out there pushing dive watches would be an understatement. The Marnaut Dark Surge 300m Series, UNDONE Aqua and Farer Aqua Compressor Endeavour are recent examples. 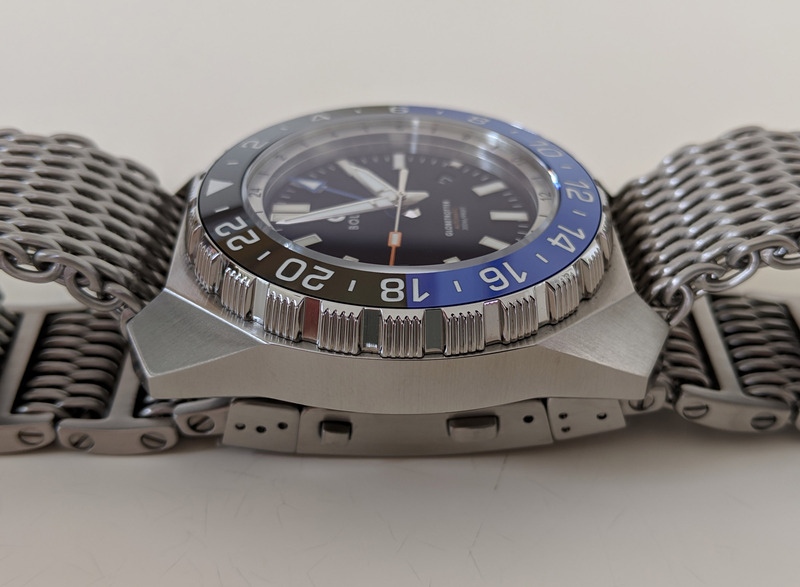 Comparable to drivers of four-wheel drive SUV’s, many dive watch owners rarely (if ever) use the timepieces for their intended purpose, preferring form over function. 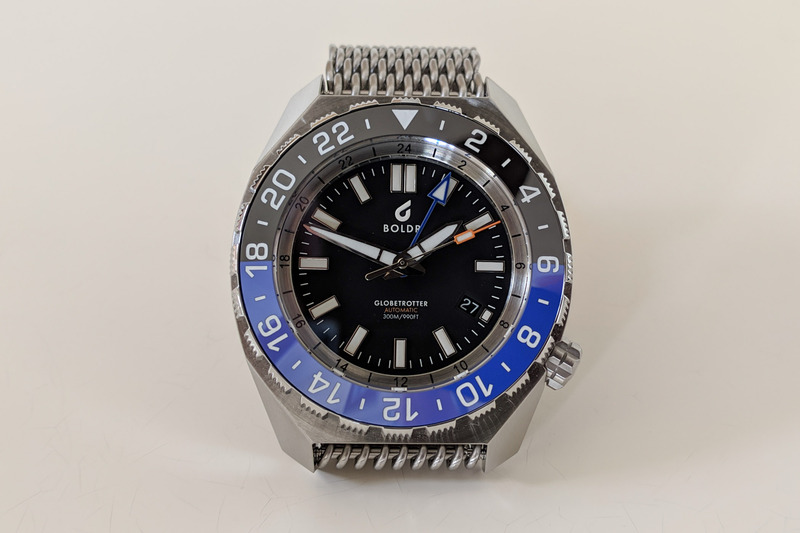 The BOLDR Globetrotter GMT seems to target that minority group who actually view dive watches as indispensable tools for underwater exploration. It’s large, heavy and angular, with sharp lines and a strap designed to buckle over a wetsuit sleeve. It’s far from an unrefined beast, however, with a coated sapphire crystal, ceramic bezel insert and Elaborated Grade ETA automatic. With the inclusion of both a date complication and GMT hand, it should meet the needs of professional divers and also land dwellers that prefer the style. And with a price under USD 1,000, this could be a sleeper hit for ocean adventurers who want a bit more than the microbrand norm. BOLDR Supply Company sounds more like a hardware store than a watch brand, but notwithstanding a few wallets and hats, watches are the company’s principal focus. 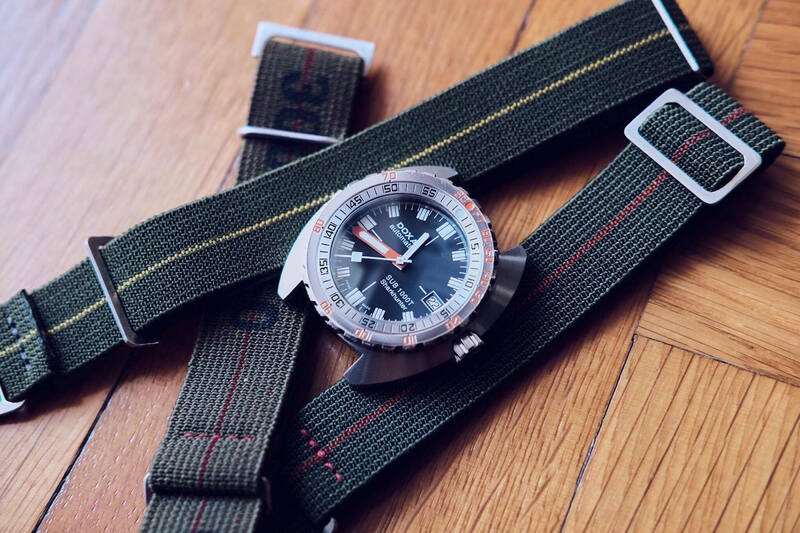 Based in both Singapore and Malaysia, the company is targeting outdoor adventurers with a range of tough field and dive watches. 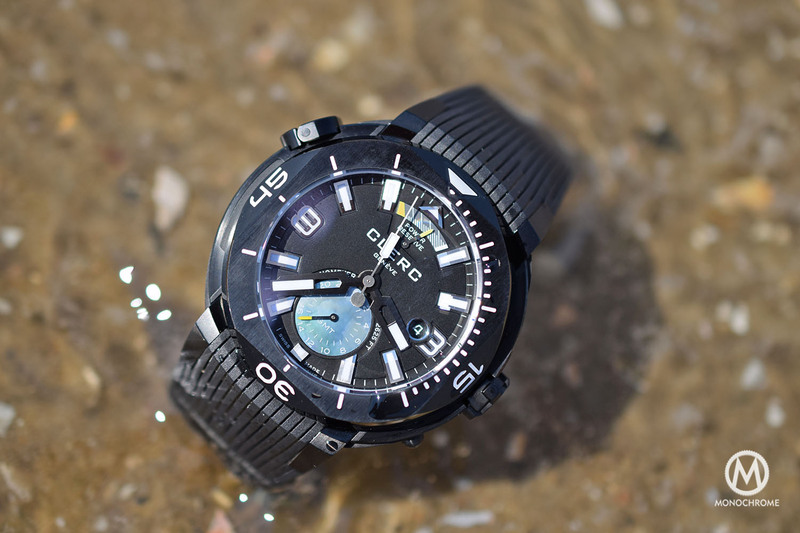 Not to be confused with another small brand, Bolder Watch, BOLDR’s portfolio includes names like Expedition, Odyssey and Voyager. The company doesn’t mince words, claiming its watches are “designed to be worn, used and abused every day.” Co-founders Travis Tan, Leon Leong and Isa Ghani believe in a set of 3 C’s – Confidence, Courage and Community – which translates to their watches inspiring confidence and courage in both the product and next adventure, and they’re inclusive to anyone who wants to take part (community). Having an affordable range of rugged automatic watches with Swiss movements helps with the latter. BOLDR has a few lines of quartz-driven watches, including a GMT and chronograph, but the Swiss-powered automatics are their most intriguing. 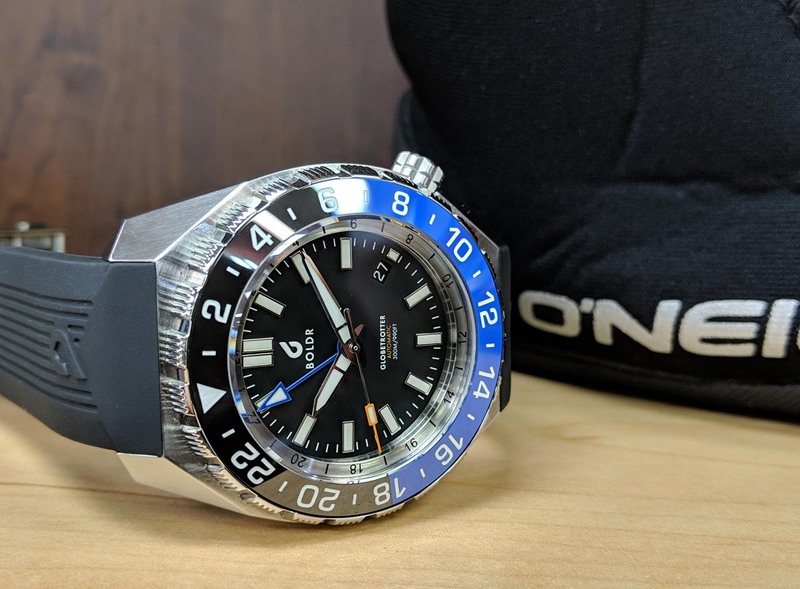 With the exception of the Expedition field watch range, the company specializes in dive watches like the tough-as-nails limited carbon fibre Odyssey (at just over USD 1,000) and affordable Voyager (at just under USD 300). The Voyager swaps a Swiss ETA for a Seiko NH35A automatic. There’s something for just about every outdoorsman, on land or at sea, with both mechanical and quartz varieties. 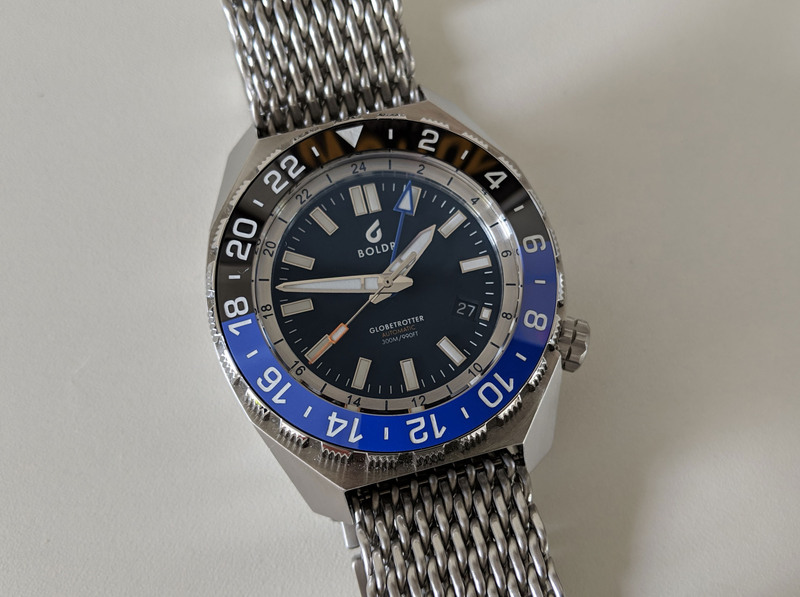 Let’s take a closer look at the new Globetrotter GMT diver, which arguably strikes the best balance of design, movement, and price. Before we dive in, the packaging of the watch makes a great first impression. 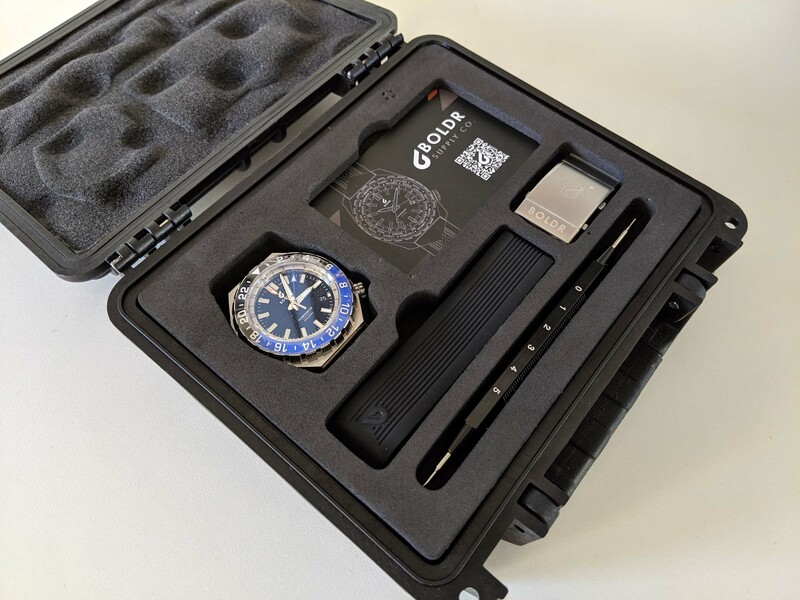 It ships in a waterproof carbon composite case with pre-cut foam compartments housing the watch, the natural rubber strap, strap replacement/sizing tool and warranty card/instructions. It looks like something James Bond would keep in the trunk of his Aston Martin. But I digress… The watch case is machined from a solid block of 316L stainless steel with a diameter of 44mm and height of 14.5mm (lug to lug – 50mm). Substantial proportions, but on the mark for a serious diver. The design of the case is refreshingly unique and doesn’t borrow from more established shapes. Hard lines and distinct angles dominate the aesthetic, reminding me a bit of the Porsche Design Monobloc Actuator 24H-Chronotimer case, although the BOLDR design is very much its own. The entire finish is brushed with integrated lugs and when viewed from the front, all four corners are sharply angled downward. The sides of the case are flat, angling outwards at the ends to form the lugs, which themselves are composed of five separate angles. If the angular F-117A Nighthawk stealth fighter was a submarine, it’d probably resemble this case. 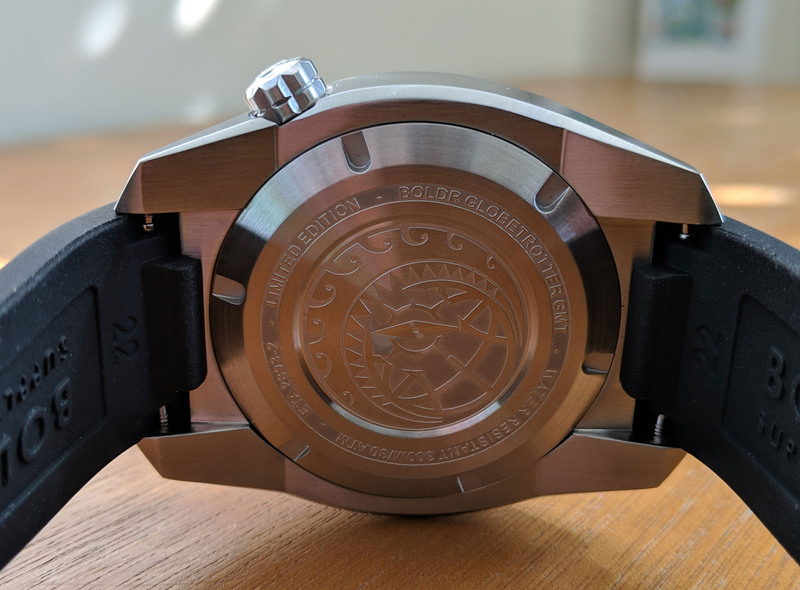 The caseback is solid steel and screwed down, with an engraving of a globe, compass, and waves. From the back, the lugs are angled inwards and there’s a nice chamfer spanning the bottom edges of the case, tapering towards the end of the lugs. The lines of the case are hard, but importantly not sharp. Everything’s been subtly rounded over. The crown is off-centre at 4 o’clock and screws down, allowing for 300 metres of water-resistance, with BOLDR’s logo embossed at the end. The bezel has a ceramic insert with a blue/black colour scheme. Blue/red is also available, along with bezels displaying the names of major world cities (great for world time, but less so for diving). The knurled edge has a tight pattern of machined ridges, which looks cool and makes for a secure grip. It’s marked with 24-hour numerals (every two hours) with a triangular marker at 12 o’clock. 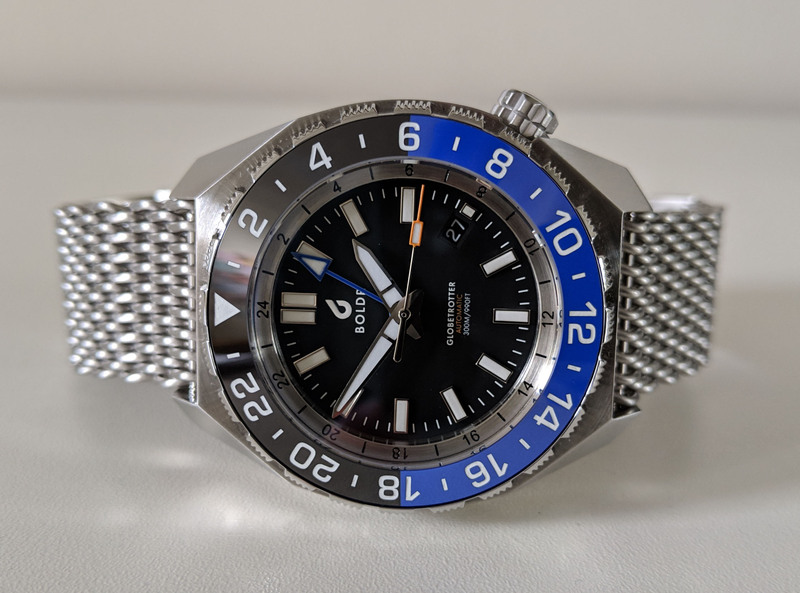 The ratcheting action feels smooth and refined in both directions (and surprisingly quiet), although I’m not a huge fan of bidirectional dive bezels. Unidirectional ones are safer from accidental adjustments. A flat sapphire crystal with an anti-reflective coating protects the dial. The dial is matte black with bold applied indices every hour (double index at 12 o’clock), all filled with Super-LumiNova BGW9. A date window is angled at 4 o’clock and positioned as an extension of the shortened index, combining to be the same size as the others. It helps maintain uniformity of the dial and I’m not bothered by it (angled date windows can be horrible). The silver sword-style hands are also filled with Super-LumiNova and the seconds hand has a red lume-filled square and tip. Legibility is outstanding, expected for a no-nonsense diver, and that combined with large, distinct numerals on the bezel make this well suited for underwater use. 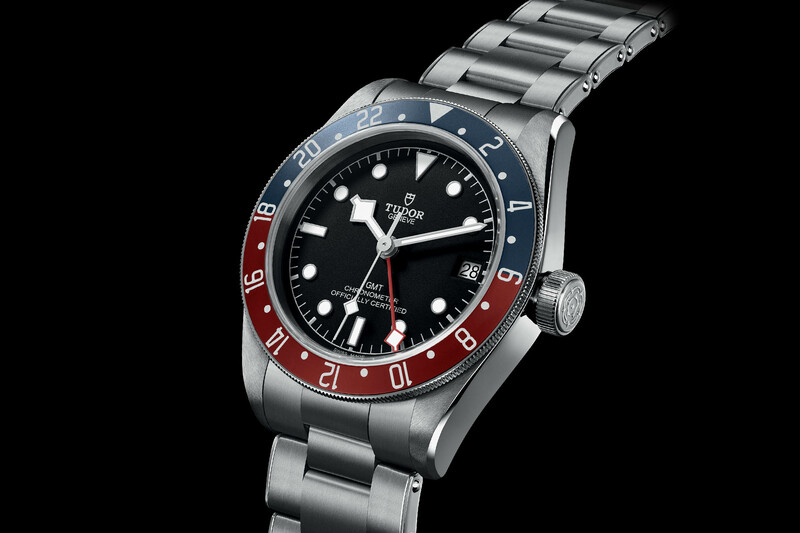 The GMT hand is blue with a triangular, lume-filled tip and does not create too much of a distraction unless needed. The bezel can be used with the GMT hand on land and there’s a smaller, internal 24-hour GMT ring. BOLDR and its logo are printed in white at the top of the dial, with GLOBETROTTER at the bottom, followed by a red-printed AUTOMATIC and white 300M/990FT. The dial is featured enough for everyday wear, although, with a large diameter and substantial weight, it may be a more occasional, purposeful tool watch for some. The beating heart of the BOLDR Globetrotter GMT is a Swiss ETA 2893-2 automatic (Elaborated Grade). It has 21 jewels, beats at 28,800vph (4Hz) with a 42-hour power reserve. Functions include central hours, minutes and (hacking) seconds, date and GMT hand (which can be set independently). Elaborated Grade ETA movements are adjusted in three positions with an average rate of +/- 5 seconds per day – a maximum of +/- 15 seconds per day is allowed. 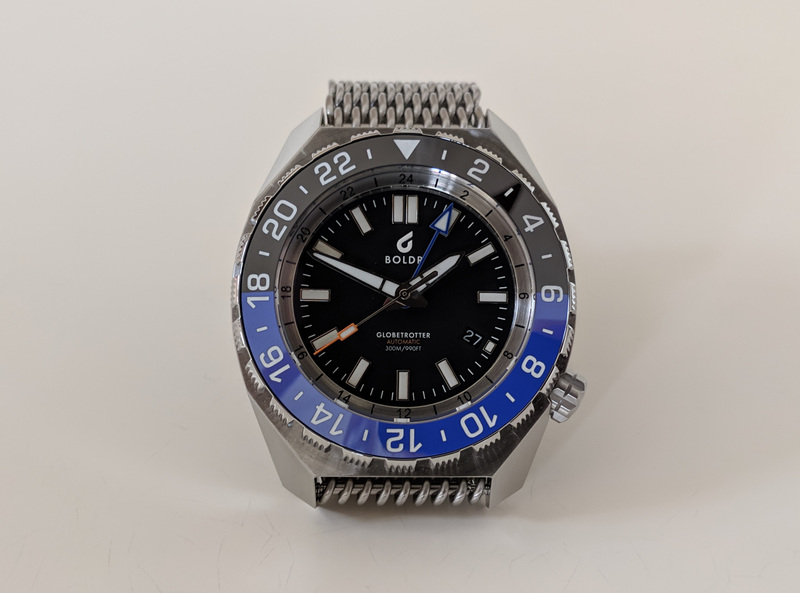 This is certainly a step up from Seiko or Miyota automatics commonly found in comparable pieces (BOLDR also offers less expensive divers with Seiko calibres). Japanese movements are reliable workhorses and easily serviced, but often less accurate and lack that Swiss-made appeal. You can read more about Swiss vs. Asian movements in our Alternatives to Off-the-Shelf Swiss ETA and Sellita Movements. The black 22mm custom moulded natural rubber strap has a stainless steel diver’s extension buckle. Like most quality rubber dive straps, it’s comfortable out of the box and perfect for repeated salt water exposure, highly resistant to corrosion and wear. 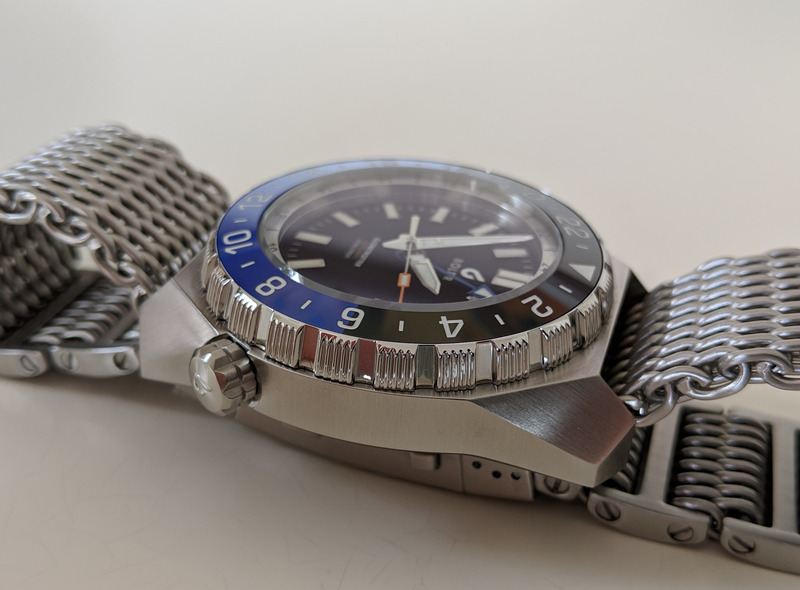 There’s an optional stainless steel mesh bracelet with the same dive extension buckle (USD 58.63). You really can’t go wrong with either, and most 22mm third-party straps can be fitted as well. 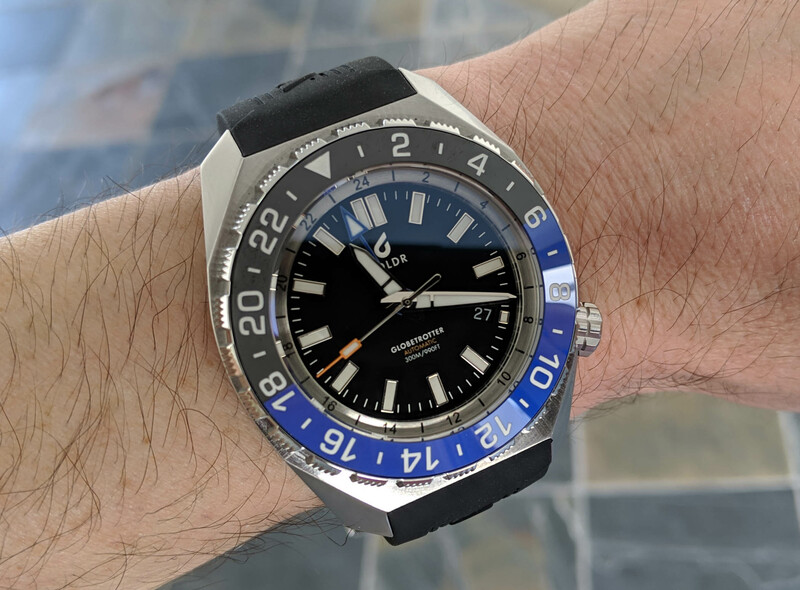 I recently reviewed the Aquadive Bathyscaphe 100 GMT and it’s a good comparison to the BOLDR piece. Both have dates and GMT hands, and a one-piece case with integrated lugs. 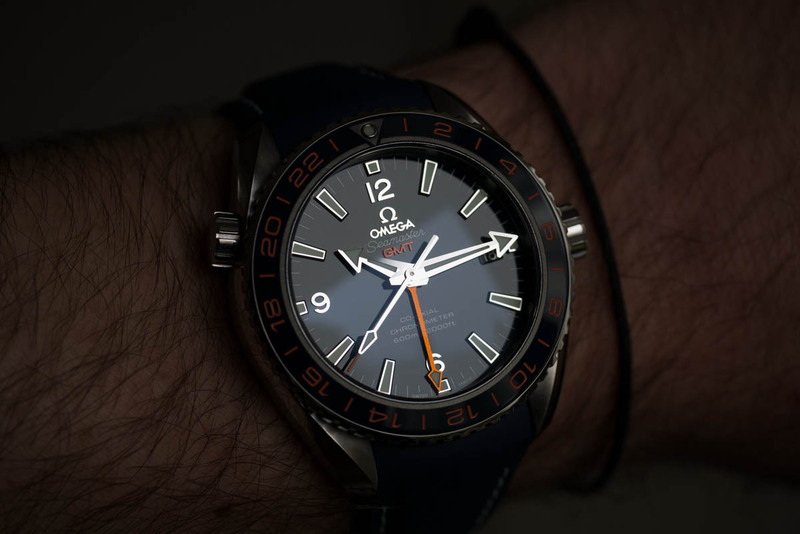 The Aquadive has a few advantages, such as a 1,000-metre depth rating, a more legible GMT ring (offered in four colors) and a helium escape valve. Both pieces use the ETA 2893-2, but the Aquadive has a slightly more accurate Top Grade version over the BOLDR’s Elaborated Grade (the difference is fairly nominal to the average user). The Aquadive is also a modern take on a classic line of dive watches from a storied if relatively unknown brand going back several decades. BOLDR doesn’t have that history. 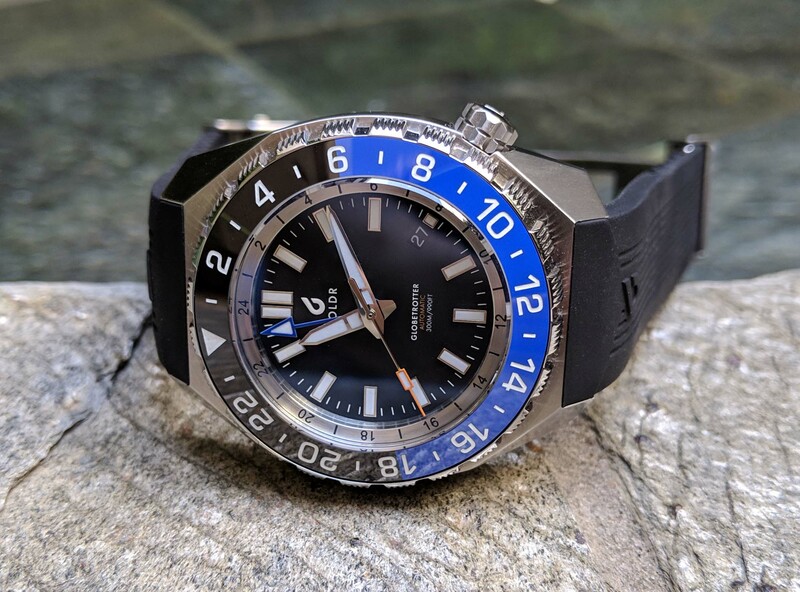 However, the BOLDR Globetrotter GMT is less than half the cost of the Aquadive, whose advantages might not be worth another USD 1,000 for some. Only saturation divers descend beyond 300 metres (a small minority of sea dwellers) and the helium escape valve is a somewhat arbitrary feature, again designed for that small minority of divers. 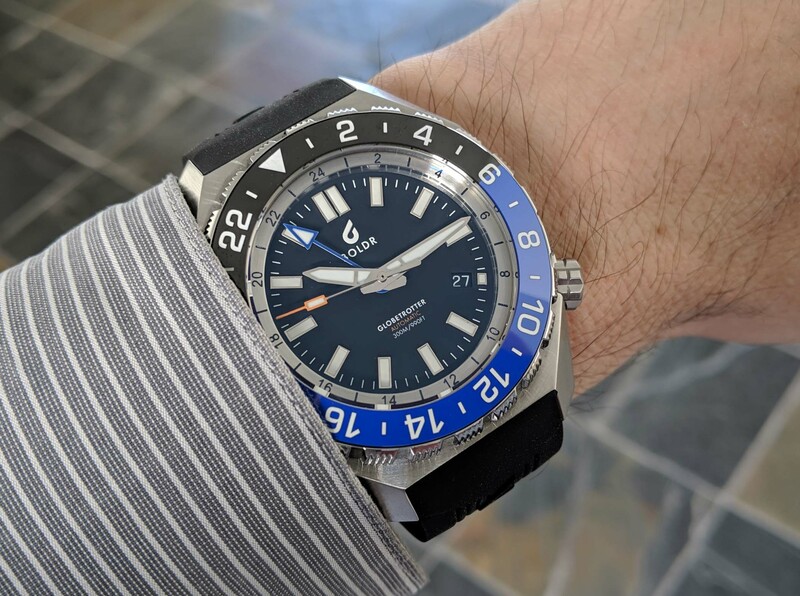 While the Aquadive Bathyscaphe 100 GMT is a refined, reborn classic that will suit just about any diver’s needs, the BOLDR Globetrotter GMT is just as capable and aesthetically pleasing for the majority. And for a watch under USD 1,000 (even with the optional steel bracelet), that’s quite a bargain. 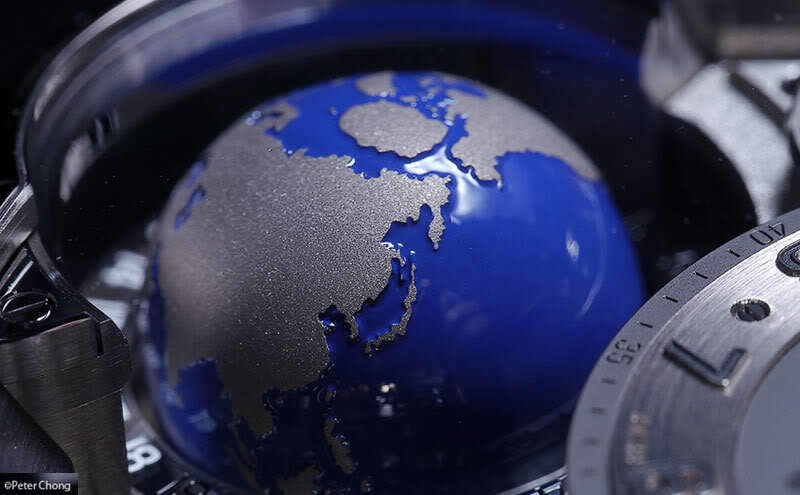 The BOLDR Globetrotter GMT retails for USD 845.36 (or USD 941.85 with the bezel of world cities). It’s currently limited to 100 pieces and comes with a two-year warranty. All variants are available now and can be purchased at BOLDR’s website. Regret not in the market. But, Impressive ad with all the information a discerning buyer would want to know well presented.